TARA’s rock art exhibition opened in Niger last week at Oumarou Ganda Cultural Centre in Niamey. 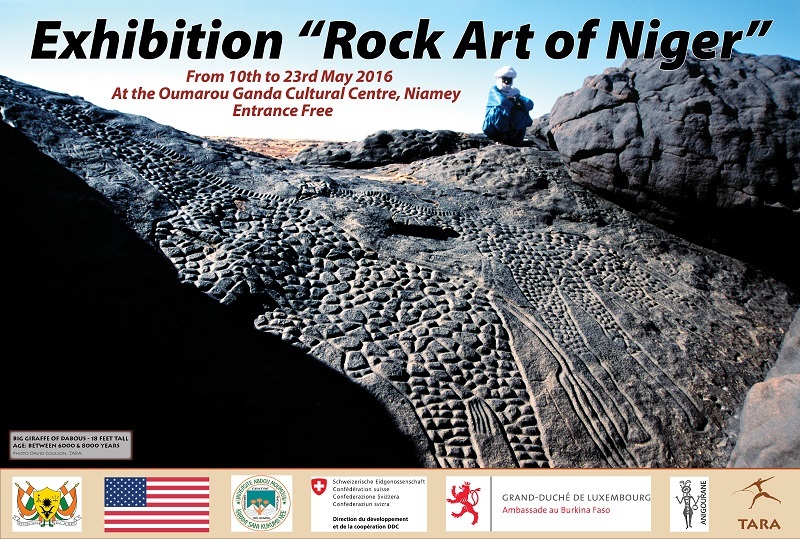 The exhibition highlights the richness and diversity of Niger’s rock engravings and will run from 10th to 23rd May. After this it will travel to other locations in the country. The exhibition could not have been possible without TARA’s Nigerien partners, ANIGOURANE, and the US Ambassador’s Fund for Cultural Preservation who have supported the project since its inception in 2015. Before the exhibition opened university students, among them TARA’s former intern Hamidou Moussa, travelled to schools around Niamey to speak to students about Niger’s rock art using the cultural mediation technique Hamidou introduced while he was at TARA. The Ministers of Tourism, Culture were in attendance at the opening ceremony and the exhibition has been well received so far. It is hoped that this exhibition will sensitise many to not only the beauty of Niger’s rock art, but also the potential rock art holds for community development.